Valentine’s Day is all about love, but we can’t leave out self-love! If you’re looking to pamper yourself with a spa day or give the gift of relaxation with a massage to someone special, we’ve rounded up the perfect Valentine’s Day packages and deals from the best spas in the Tampa Bay Area! 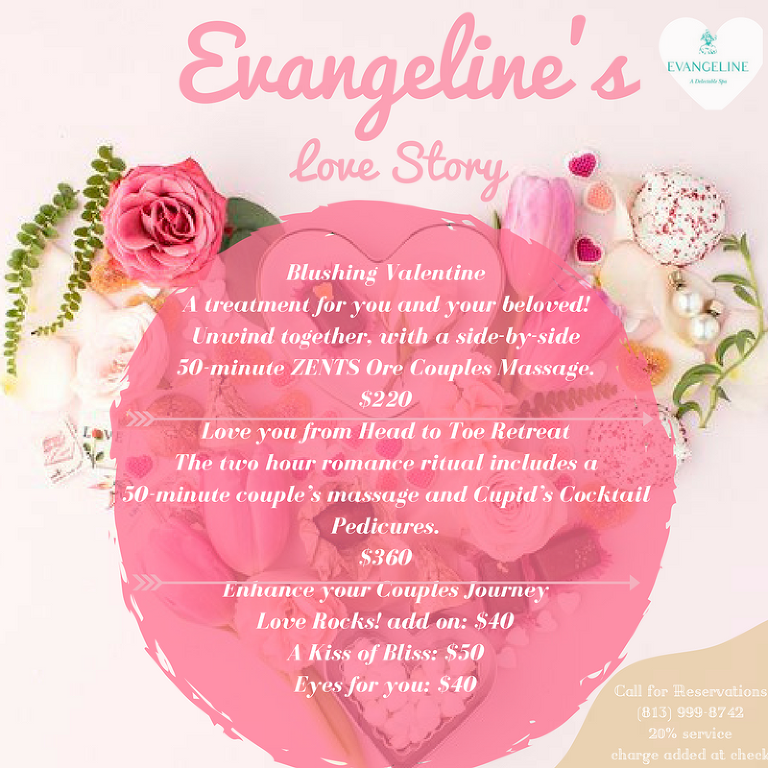 Tampa – Unwind together, with a side-by-side food and wine themed massage experience at Spa Evangeline! Your treatment will be custom curated with your choice of Swedish or Sensory Aromatherapy, and is paired with a complimentary glass of wine or champagne! Special proposal surprises can be arranged ahead of time, including rose petals in the treatment room and champagne. Clearwater – Countryside Country Club & Day Spa invites you to experience skincare at its best with treatments customized specifically for you. The personalized customer service and the experienced therapists will impress you, as well as the affordability of treatments and massages! Book these special Valentine’s Day packages through February 14th or put the package of your choice on a gift certificate! The Happy Couple: (2) 55 Minute Relaxation Massage AND (2) 55 Minute European Facials, Only $198 per couple. Contact the Spa ahead of time, and arrange for champagne, roses, chocolate covered strawberries and decor to be waiting in your loved one’s treatment room! Mention Marry Me Tampa Bay and add a 25-Minute Massage or 25-Minute Refresh Facial, a $50 dollar value! 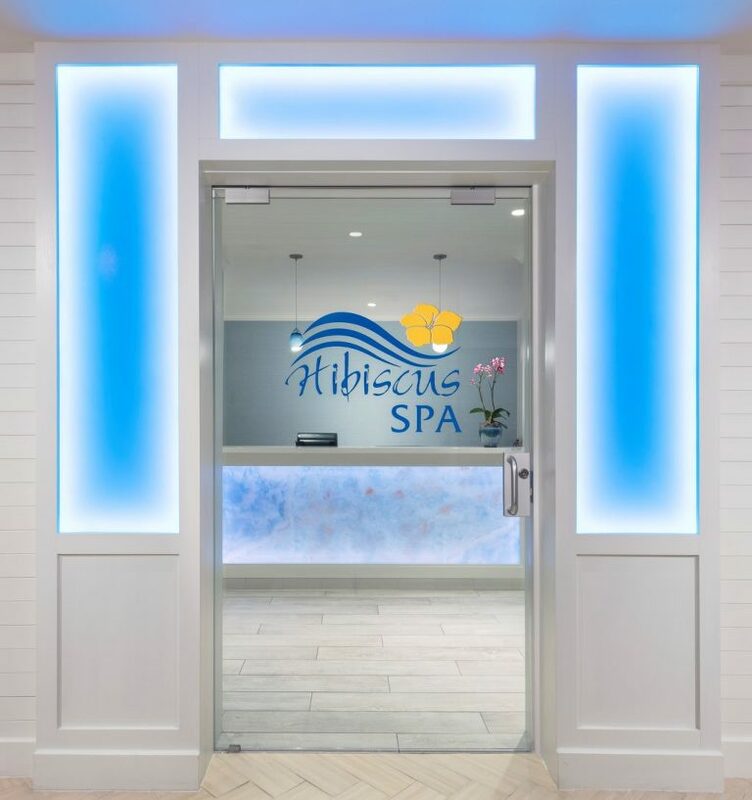 Clearwater Beach – Hibiscus Spa is offering three luxurious Valentine’s Day packages whether you are looking to treat yourself or relax with your someone special. Their traditional couple’s massages are performed in a couple’s suite. All of their signature massages include the use of an herbal hot pack to loosen up your back muscles, an herbal eye pillow and use of warm steam towels on the feet for your comfort. All packages include a glass of champagne, and all specials are valid the whole month of February. Looking to pop the question? Hibiscus Spa can tailor The Sunset Beach Retreat to fit your style including hiding the ring or writing in the sand while you’re in the massage session. The hotel also offers a ‘Dining Under the Stars’ package that can be combined for the ultimate seaside proposal. Mention Marry Me Tampa Bay to receive a goodie bag upon your arrival! Clearwater Beach – Book any 90-minute Couples Massage at Sandava Spa and receive a complimentary Sandava Spa Foot Scrub, through 2/28/18! Guests of the spa enjoy the Hyatt Regency’s amenities of the Gulf view pool deck, Sky Terrace with Jacuzzi hot tub and the relaxation lounge overlooking the intra-costal waterways. With vistas and picturesque sunsets of the Gulf of Mexico, the Hyatt Regency Clearwater Beach is the perfect spot to pop the question! With on-site concierge services to guide a would-be groom, they’ve got your every detail covered. Clearwater Beach – During the month of February, enjoy a special deal on a relaxing couples massage package at Pallavi Luxury Spa! Customized proposal packages are available, which could include the signature couples massage and hydrotherapy bath experience in the luxurious couples suite. Following, a romantic dinner in Ocean Hai can be arranged overlooking Clearwater beach and the beautiful gulf. Book your Valentines day special before February 12th to be entered to win a Pallavi Luxury Facial during the month of April. St. Pete Beach – Spa Oceana‘s ocean-themed services of healing treatments sourced from around the world are especially special when shared with your one and only. Take your pick of three couples treatments, or go all out with the Day of Indulgence Package! These Valentine’s specials are valid the entire month of February. Buy your loved one a gift card for our incredible Day of Indulgence Package and receive a luxurious spa robe to present with your gift card! Is a proposal in the mix? Speak to the Spa Front Desk team and inquire about our Proposal Package! Speak to a representative ahead of time and they can assist with arrangement of spa treatments, champagne toast, photographer, and dinner reservations!